So I got my knives back Friday and they are nice and sharp once again. Looks to me though like that's an overly acute bevel they put on Nicolette's heel, and the return seems a bit more rounded than before. I'm not complaining. Should I be? My family surprised me by buying me that 2nd chef's knife that I needed! So Nicolette now has a twin but I haven't named her yet. Suggestions? Call me crazy but I've been looking into getting names etched onto the blades. I actually thought of engraving at first but worried about food residue in the grooves. Been doing some research on electroplating. I think maybe Jep sensei & I will MacGyver this project hehehe. I am finally getting my knives back tomorrow. I brought Nicolette (yes, I named my chef's knife hehehe) and two other knives to Zwilling Henckels (SM Megamall 5th level) Friday last week to have them sharpened. I was told to wait two weeks for them (a long time to be without my knives!) but thankfully they're ready for pick-up. Over the past few weeks I've been acquiring new tools to add to my chef's kit: Heat-resistant (600°) silicone spatulas by Oxo. 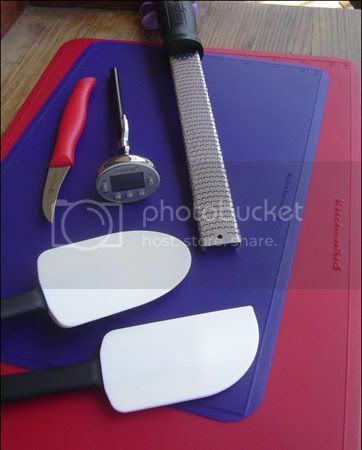 Silicone baking mats by KitchenAid. Digital instant-read thermometer by Polder. Grater/zester by Microplane. 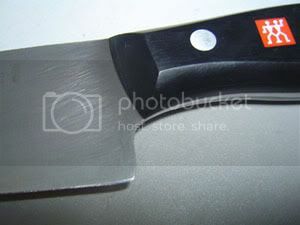 Tourne knife by Zwilling Henckels. And another set of Edge-Guards for the second set of knives which I have yet to buy. Thanks to Ate Sandy, and to Jep for getting me the stuff from the States. The other day Steph & I were at Japan Home Center (Robinson's Galleria 3rd level) aka the 88-Peso Store and was pleased to find they were having a sale: about a third of the items were priced at only PhP55.00! I immediately went for the kitchen stuff: flexible knife mats, el-cheapo sauce pans, kitchen shears, and so on. Looking at the labels though, Steph pointed out that a lot of them were marked "Made in China". Now I don't mean to generalize, but with all the recent controversy about lead content in chinese-made products I've gotten a bit wary of them, especially if said items are going to be used on food. I sadly put the items back on the shelves. I did buy the 3-piece level set (line, torpedo and and mini) for my other toolbox. An aside: an item I have yet to buy is a handheld blowtorch, and it would belong equally in my chef's toolbox and my handyman's toolbox hehehe. when I got home I checked the gear my friends had bought me in the States. Polder has their stuff manufactured in China. So do Oxo and KitchenAid. What's a chef to do? Ah well, I trust these brands have good quality control.